All of our beers are bottle conditioned and contain a live yeast sediment. This means that our beer continues to condition and mature after bottling, developing increasingly subtle and complex flavours and aromas, and a gradual, natural build-up of dissolved CO2 which gives the slight sparkle when you come to pour it. This is what CAMRA defines as a ‘Real Ale’, in contrast to a beer that has been pasteurised to kill the yeast, and artificially produced CO2 pumped in to it before bottling. Although this can give more uniformity, it gives little opportunity for increasing depth of character. As a rough guide, all of our beers can be drunk a week or two after bottling but will continue to improve with time. The lower alcohol strength beers, e.g. Lopwell Gold, are at their best as young beers, from around 2 weeks to 6 months after bottling. The higher alcohol strength beers, e.g. 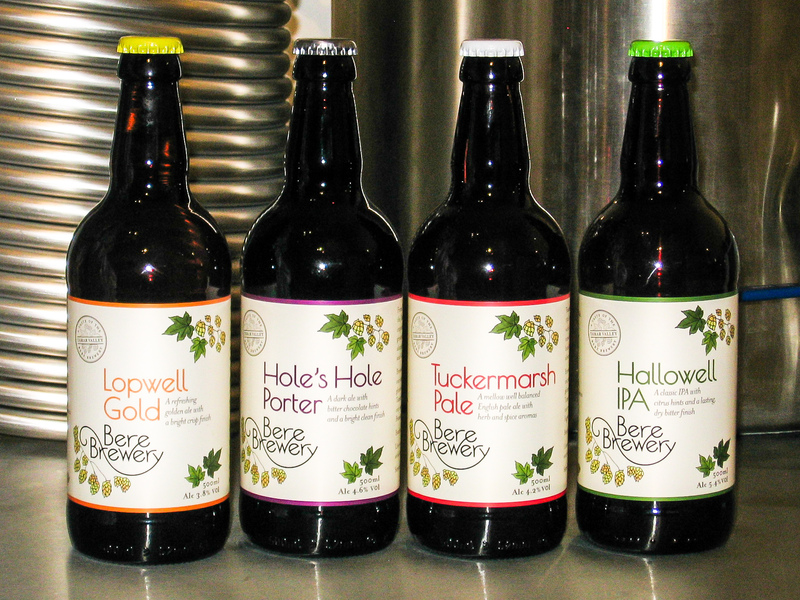 Hole’s Hole Porter, are at their best as more mature beers, from around 4 weeks to 9 months after bottling. Mind you, we’ve opened some strong dark beers from brews years ago that have kept perfectly well and developed a superb richness of character ! Our beers are made from water, malt, hops and yeast. A small amount of sugar is added at bottling to assist with secondary fermentation and with some beers we may add small amounts of fruit, spices, honey or oats to give a more complex flavour. There are no chemical additives, and all our beers are suitable for vegans. In addition to our “core” range of five beers we also produce seasonal beers including Whitsam Wheat, a refreshing summer beer, and High Cross Harvest, a pale ale brewed with freshly picked “green” hops. Watch out for other seasonal beers in the future!